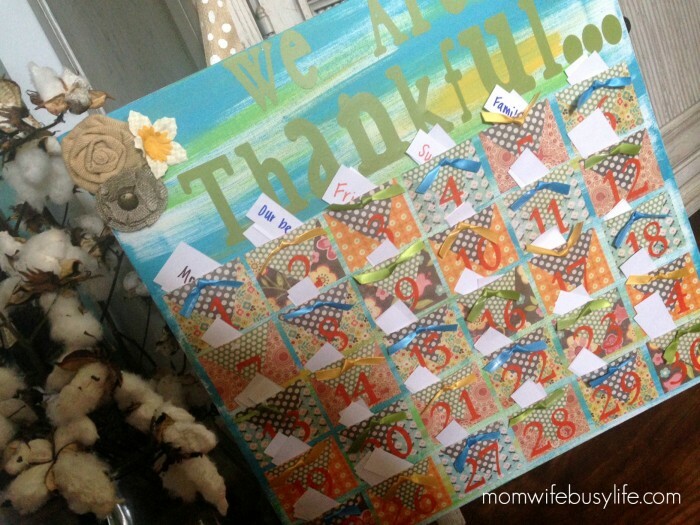 How to Create a "We are Thankful" Board - Mom. Wife. Busy Life. So often, we have to remind our children to be thankful for the many blessings we are given on a daily basis. Especially during this time of year, it’s easy for children, in their innocence, to get caught up in thinking about what they want for Christmas. To humble my own children and to teach them the value in giving thanks, we created this sweet little thankful board. This fun-family project can be designed in so many ways to fit your family’s personality and can be as simple or as detailed as you’d like. Each day, take time to sit down as a family and jot down a few things you are thankful for. At the end of the month or on Thanksgiving Day, spend time talking about the many things your family was thankful for during the last month. I hope this project brings your family closer together and brings the spirit of thankfulness into your hearts. Paint your canvas and allow to dry. Using a paper cutter, cut scrapbook paper into (30) 2 1/2X 3 in. squares. 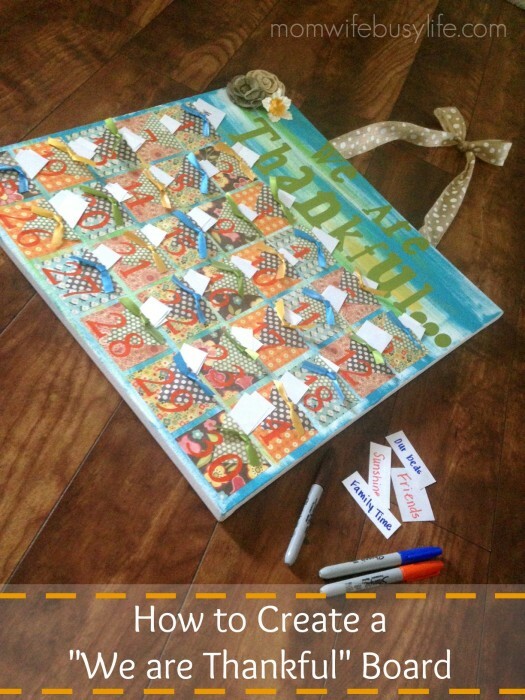 Number each square 1-30 using either vinyl numbers or marker. Cut, tie, and stick ribbon using a glue dot to the top of each square (you can also purchase pre-tied ribbon in the scrapbooking section). Lay out your squares on the canvas prior to gluing to make sure they are even. Run a bead of glue down the sides and bottom of each square and stick to canvas. In the remaining space at the top, give your board a title. Use paper scraps, to cut strips that will fit in each pocket. Each day, as a family or each person, will take a strip and write down what they are thankful for and place it in that days pocket. This is such a great, unique idea! It’s so important to remember what we’re thankful for and not take things for granted.